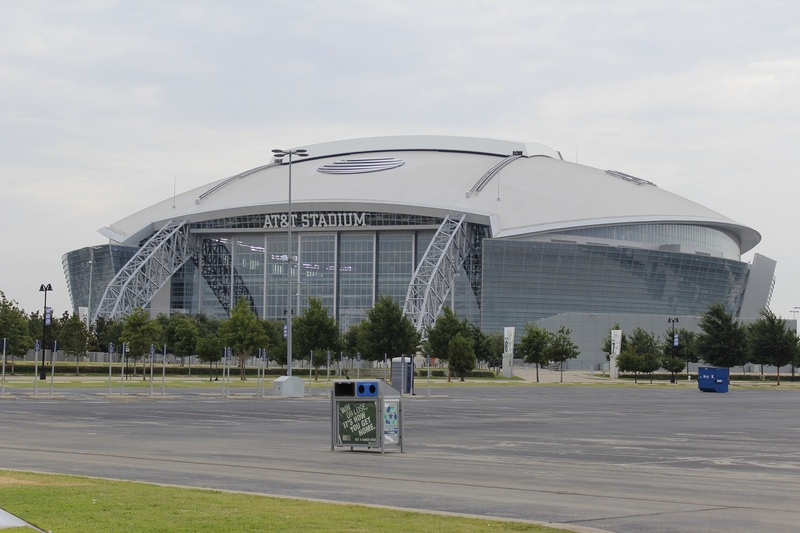 We left Florida with Warren Cromartie’s blessing and we had a long road toward Arlington Texas. 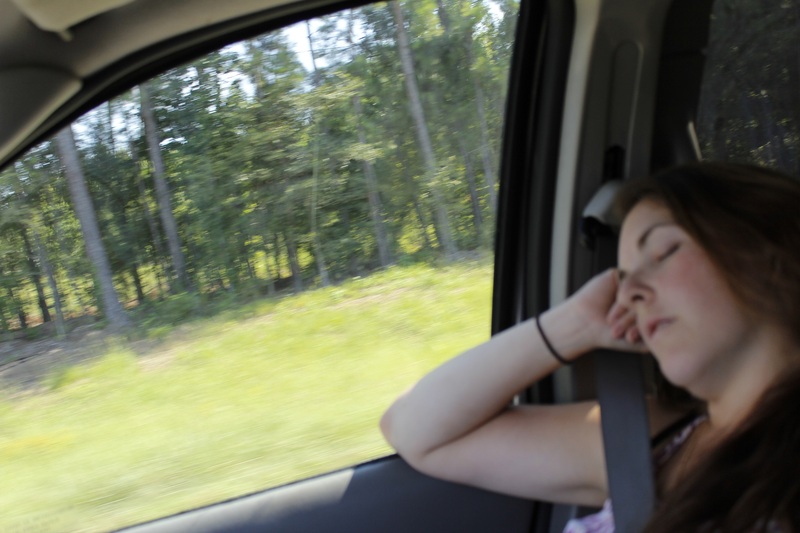 We had about 20 hours to drive and we were in a little bit of a hurry! With the AC blasting cold air in our face, we drove up north in Florida and crossed into Alabama and then in Mississippi. We found a Wal-Mart there to sleep before the last 8 hours’ drive. The weather was nice to us and we knew we could sleep well but our sleep was troubled by police car’s doing random sirens tests (?). 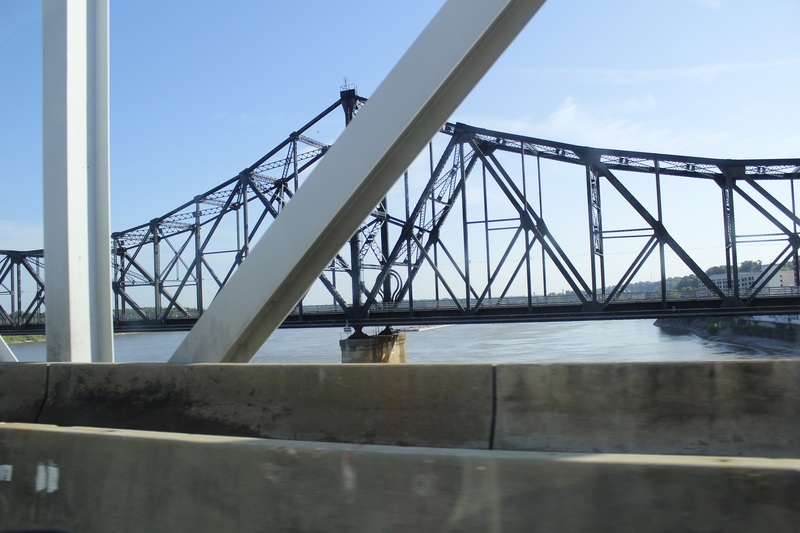 The next day we woke up and we drove we went across Mississippi and finally crossed the River with the same name to get into Louisiana. Unfortunately, we didn’t have any time to stop in New-Orleans. We stopped on the way to buy Cajun style peanuts but they were way too spicy for Adry! We finally reached Texas (with the 100 Km\h speed limits). 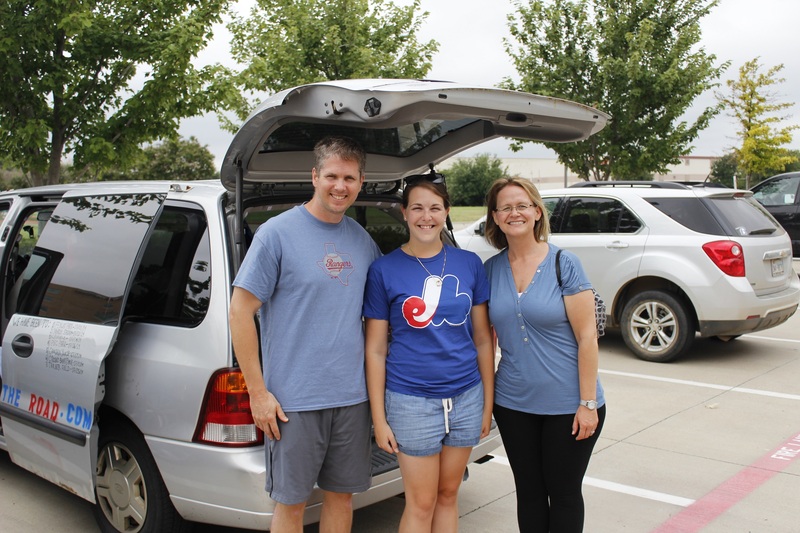 We then got to our final destination in Arlington where we were meeting with Martine and Frederic. Martine and Fred are both from Montreal and we had already met before leaving for our 3 months trip. 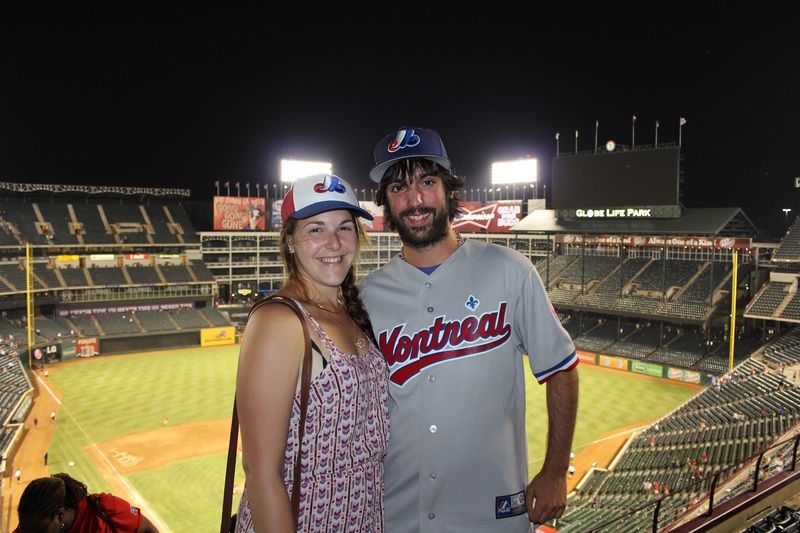 They along their life, traveled across the United States and they already have seen all 30 MLB ballparks, thing we are trying to do during our summer! They gave us really good advice before we left and while we are on the road. They were both big Expos Fans before they left. They even travelled to the old Shea stadium to see the last games that the Expos played in 2004. 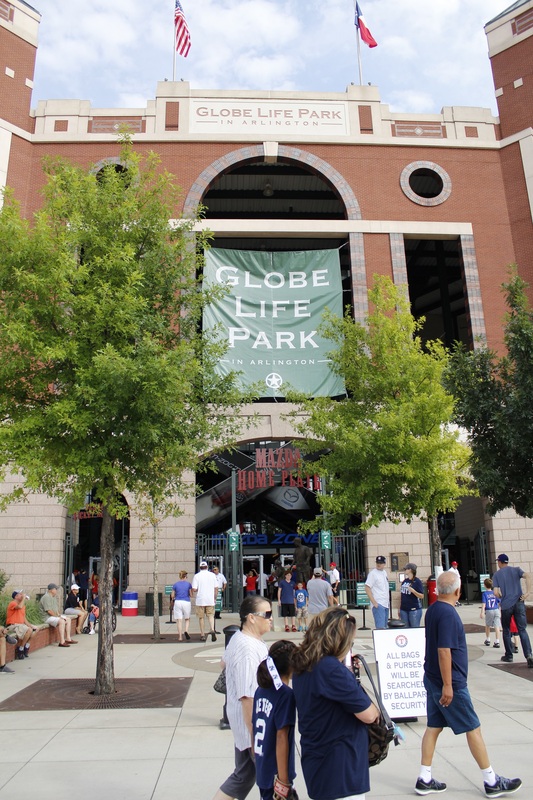 They have also seen many games in minor leagues ballparks and spring training parks. We could say they are big baseball fans. When the Expos left, they had to find another team to root for. Their choice was the Texas Rangers (partly because of the Brad Wilkerson’s trade). 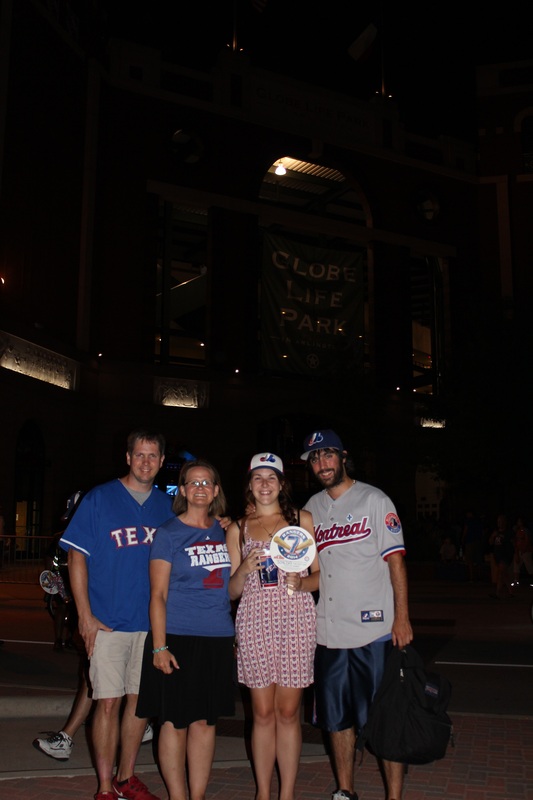 They are travelling each year to Arlington to attend a few Rangers games and they’ve done it for about 10 years. They offered us to stay in their hotel room in Arlington so we could get a good night of sleep after the game. 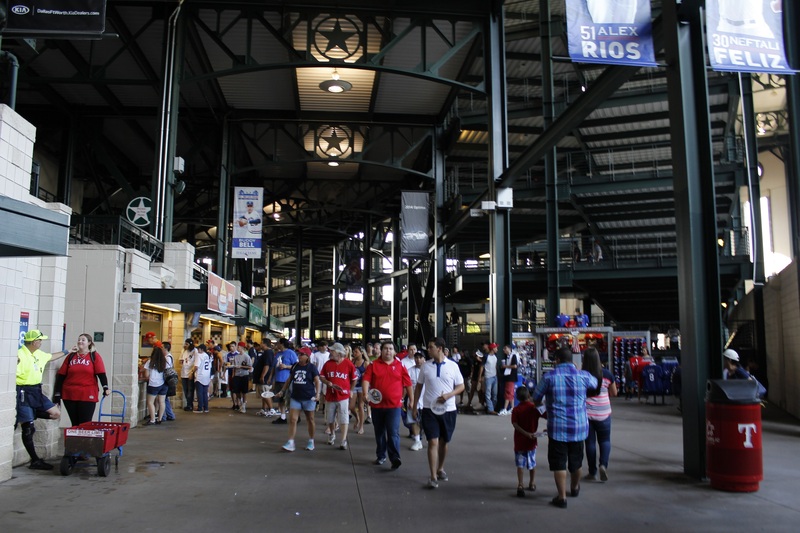 Inside the ballpark, we saw those Rangers fans buying the 2 feet long hot dogs. Impressing! When they built the stadium, they left a small section to look like the old ballparks: old school seats and metal beams supporting the upper deck above. When walking inside the park, we could see a lot of these metal beams reminding the old stadiums like Fenway Park. 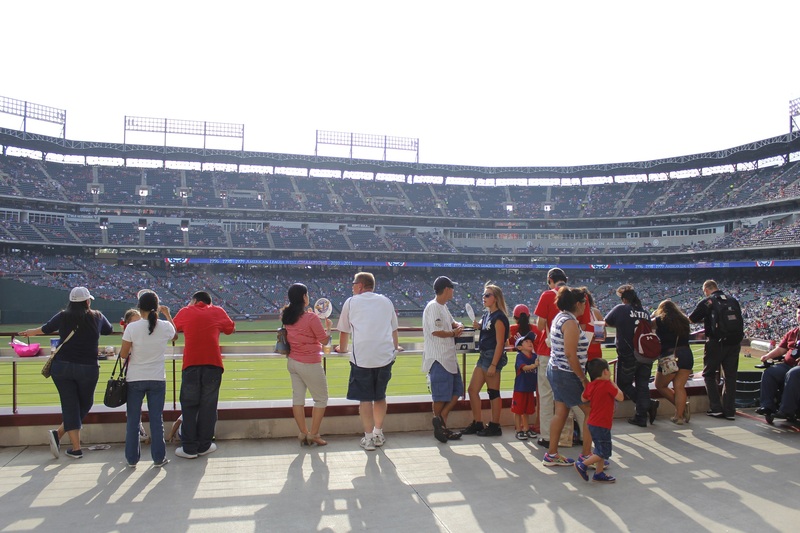 Going on the upper deck, we got to walk on a promenade behind the seats where we had a great view of the surrounding area and the AT&T stadium. 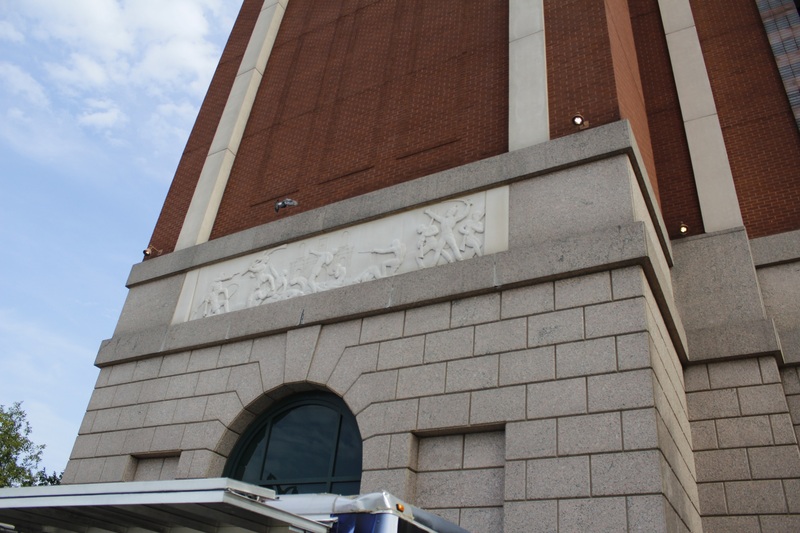 All the ballpark is a nice representation of the southern architecture. It reminds us of the old town in Fort Worth. All the way around the park you can see the famous Texas Stars, Texas is the Lone Star state. For the game, the Rangers were playing the Yankees. 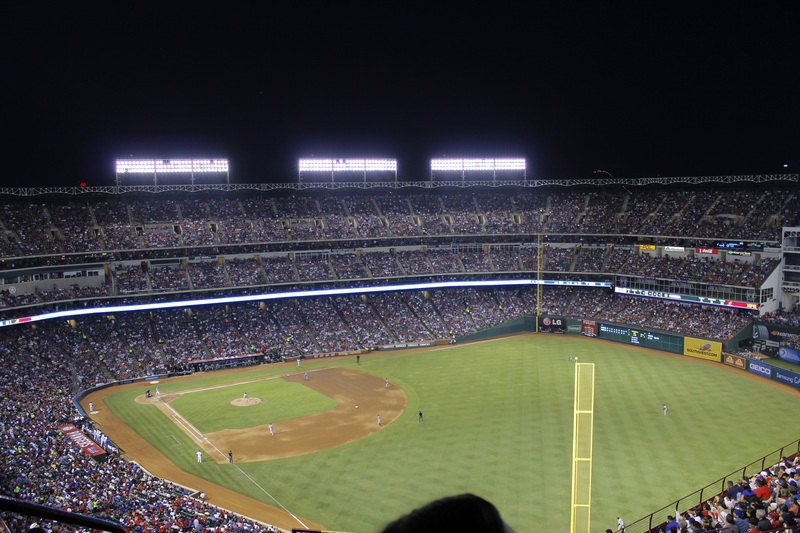 It was the last game of the series and the last game of Derek Jeter at Globe Life Park in Arlington. For those who didn’t knew, Derek Jeter, All-Star short stop for the Yankees is going to retire at the end of the season. It’s his farewell tour. In all the ballparks the Yankees are going, the local teams are arranging a special ceremony to honor him. Derek Jeter is pretty special for me. My first baseball game outside of the Olympic stadium was at the old Yankee Stadium. Derek Jeter was playing and I was impressed by him. Next year I broke my piggy bank to buy myself the official jersey with the number 2, which I still have. So it was the last time for me to see Derek Jeter on a baseball field. You should go check the prices for his last game at the Yankee stadium: average price for one ticket is 1150$. The Rangers showed a special montage before the game to honor Derek Jeter. The video was relating the event of 9\11. President George W. Bush went to the Yankee stadium and had a talk with Derek Jeter before he threw the first pitch. So who else than ex-president Bush to throw the ceremonial first pitch. Since Bush is from Texas and ex-owner of the team, the fans gave him a big ovation. Since this game was special, we had two major problems. First of all: Yankees Fans everywhere! I love the Yankees and I am (secretly) a big Yankees fans but on this trip we always try to catch the vibe of the local fans. 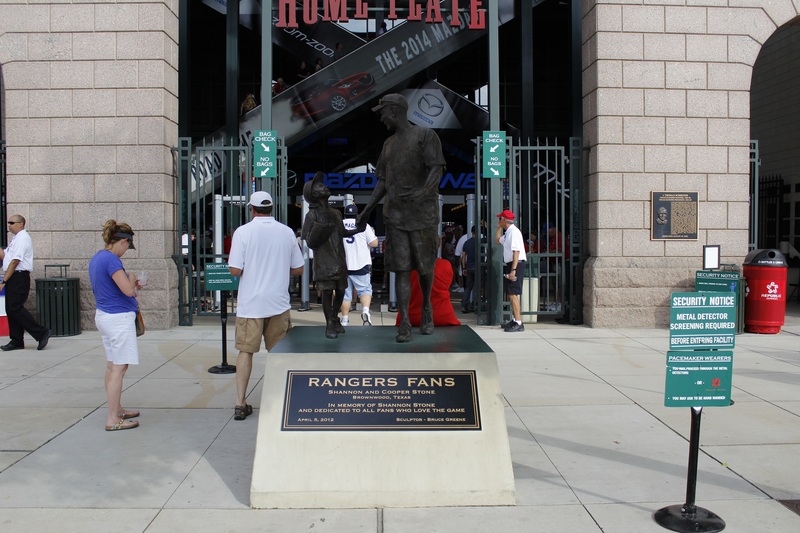 Second of all, since this was Jeter’s last game in Arlington, ticket prices were really high. We had to pay big money to be seated really far from the field. Also, we couldn’t see some angle of the field and had zero view of the giant screen! But we both stop caring about all of this when we are seated and are watching the game. The Rangers fans seemed like a young fan base (a lot of family were present). The people were buying a lot of food at the game: cotton candy, nachos, ice cream, etc. Talking about ice cream, Martine told us about an American baseball fan that said he was missing the old Olympic stadium because it was the only ballpark with a full dairy counter! The Texans are really proud of their state. They are born with sports in their blood. They love all the sporting events and it’s a culture that really helps a team to survive. Martine and Fred told us that, everywhere they go in Texas, whatever the time of the year, they will see people wearing the t-shirts of all the sports teams: Rangers, Cowboys, Longhorns, Mavericks and even the Stars! Is Montreal a city with enough ‘’sports’’ in its blood to get a second chance with a professional baseball team? We strongly believe that yes! Baseball in the United States is not only a sport it’s a happening. We were both witness to that last night in Arlington. According to Martine and Fred, it’s hip right now in the Dallas region to go to the Rangers games. The team had a few good seasons in the last years so people are still going to the games even though they are having a terrible year. This, and the Derek Jeter happening, explains why the attendance was 46,000 people. 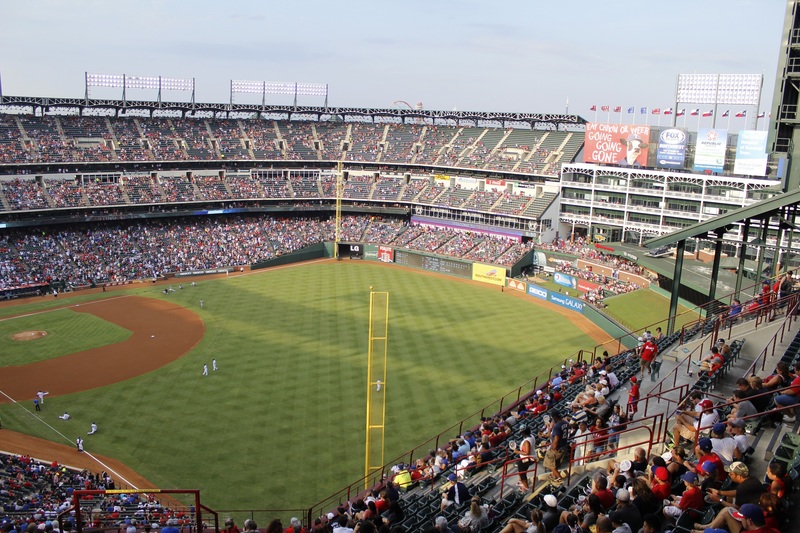 Are the rangers got the good recipe for baseball? We could think that they do. Motivated fans coming to the game, really nice and neat ballpark and a team that can get good seasons and a few post seasons appearance. Only problem: monster traffic jams when coming out of the ballpark. But people didn’t look to be in a hurry and nobody rushed out of the game before the end. After the game, we lived a special experience with Martine and Frederick. The four of us went to the Cowboys dance hall: a huge bar with a big dance floor. When we got there, the people were dancing in couples to the sound of country music. A little bit like we imagine Texas as tourists! At midnight, country music switched to pop music and surprise: the 250ish people on the dance floor started to dance in a huge choreography. This last for about 15 minutes and we were really impressed by that scene! After the 15 minutes, country music came back and everyone returned to couple dancing! How about them Texans! We’d like to thank Martine and Fred to offer us a room to sleep and a good meal in Arlington. We were really happy to meet up with you guys and talk about baseball an American culture. They are both real Rangers fans and their word about the Rangers is better than the one of someone in Texas that just joined the bandwagon. We wished them a safe flight home and we will keep in touch when we will be back in Montreal! Next stop: Houston and the Astros! P.S. This morning, we visited Fort Worth for an hour. Did you know that cattle still walk in the streets twice a day? The famous longhorns are accompanied by cowboys and all of them cross the streets under the eye of surprised tourists like us!